John Knox Tibbits attended St. Paul’s School from 1880 to 1888 and is a member of the Form of 1887. He taught Latin at St. Paul’s School from 1894-1910. His mother having died when he was a child, he entered St. Paul’s at the age of nine; for his father felt that his uncles, Charles and James Knox, masters at the School, would look out for him. He remained in the School eight years, distinguished himself – although frail and light – as a player of cricket, racquets, and tennis. He was a charter member of the Cadmean, and he and M. K. Gordon, his close friend for seventy-five years, were Associate Head Editors of the Horae. He was awarded the School Medal in 1887. After graduating from Yale in 1892, he studied for the ministry, first at Yale, and afterwards at Exeter College, Oxford, where he received the degree of A.M. He returned to the School as a master (without salary) in 1894, lived in the Lower School and taught Latin – and also, that first year, introduced golf to the School; laid out the course himself and paid all the costs for several years. He was ordained deacon in 1897, and priest a year later. Shortly thereafter, though he remained a master, he was named priest-in-charge at St. Timothy’s Church. His chief work was among the stone-cutters and quarry-men in North Concord. He built a chapel there, and worked among them for years. In 1910, he married Marguerite Vinton Harris, resigned his mastership, and built the house on the road to Concord (now Winant House) which he afterwards sold to Governor Winant. . . John Knox Tibbits gave much to St. Paul’s School and to the parishes he served in Concord and elsewhere. He was a very intelligent man, whose outstanding qualities were humility and unselfishness. John Knox Tibbits’ name is recorded on one of the panels in the Chantry listing Alumni clergy of St. Paul’s School. Imprinted with photography studio logo and information: "W. G. C. Kimball, Cor. Main & School Sts. Concord, N. H." "J. K. Tibbits" written in ink across the top edge with "1880-1888" written in pencil beneath it. 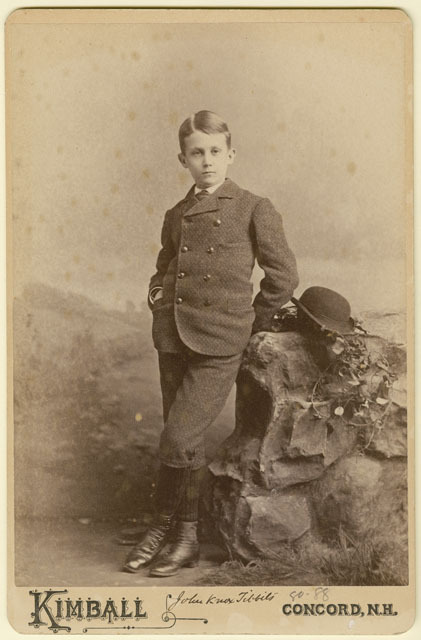 A standard cabinet card with photograph mounted on heavy paper board. "Kimball Concord, N.H." printed along the bottom edge of the card with "John Knox Tibbits" written in ink and "80-88" written in pencil between the printing. Kimball, Willis G. C. "John Knox Tibbits." St. Paul's School. Ohrstrom Library Digital Archives. Web. 24 Apr. 2019.